Mariah Carey revealed her new album art yesterday, but she wasn’t exactly greeted with a warm reception. The Elusive Chanteuse posted the cover of #1 to Infinity on Twitter, and honestly it looks pretty much like three other of her album covers: Mariah in front of a plain backdrop, posing with a leg thrust out. Nothing new there. The problem, if one wants to call it that, is that Carey looks a great deal taller and thinner than we’ve seen her in recent years — and fans are not letting her get away with it. People on Twitter called out the cover shenanigans immediately, and they were pretty rude about it. Not that they are necessarily wrong. 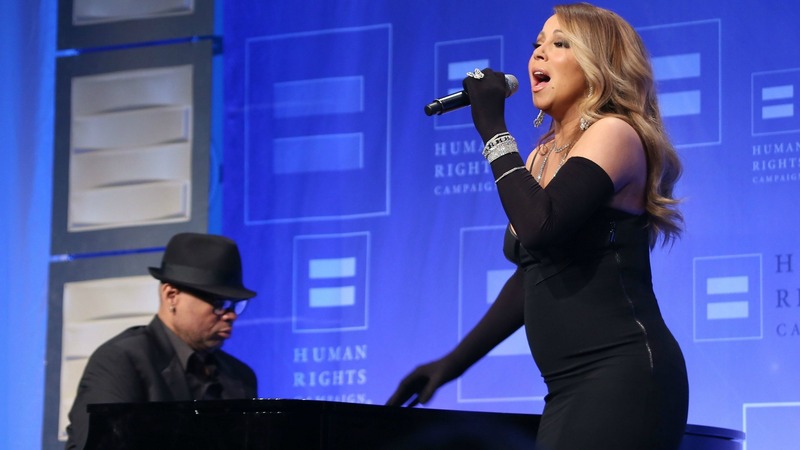 The photo at the top of this article was taken on March 14, 2015 at the Human Rights Campaign Los Angeles Gala, and the singer clearly is not as thin and toned as she appears in the album art. The real question is why, after a 25-plus-year career earning her a place with ultimate divas like Aretha Franklin and Whitney Houston, does Carey feel like she has to present her body in such an unrealistic way?